You would be forgiven if you thought jailbreaking was dead. There hadn’t been a good, untethered jailbreak for iPhone 4S or iPhone 5 running the current version of the iOS operating system for some time. But this week’s launch of the new “evasi0n” jailbreak demonstrates the pent-up demand in the jailbreak community for a new release. Immediately upon its debut, traffic to evasi0n.com flared, and the jailbreak app store Cydia became nearly unusable due to the huge influx of users. By some early reports, the jailbreak had sent Cydia usage to 1.7 million times the day after its release. Now that number is much higher – over 4 million jailbreakers have used Cydia since evasi0n’s launch, according to Jay Freeman, the jailbreak app store’s creator. That’s impressive, but still short of the 22.8 million total unique devices running Cydia during the two months prior to evasi0n’s launch. Of course, all these numbers also include many older iOS devices, such as iPhones, iPads, iPod Touch devices and Apple TVs, not all of which are capable of running iOS 6 or using the new evasi0n jailbreak. (Evasi0n doesn’t support the current Apple TV, for example). But that’s not to say that the jailbreak hasn’t hit. And hit hard. Matthew Prince, CEO and co-founder at CloudFlare, the content delivery network (CDN) and security service tasked with managing evasi0n.com’s load, said that CloudFlare delivered 2.9 million pageviews at its peak, per hour for evasi0n.com. Traffic had been building up all week and topped off around 8:15 AM PST Monday. CloudFlare also saw 27,952,010 requests to the site, and approximately 960,000 Megabits of traffic per hour during its peak period. Prince said that there were 121,191,058 requests to evasi0n.com over the last week, and CloudFlare handled 81 percent of them, saving the site a total of 98 percent of the 1.2 terabytes of bandwidth it would have otherwise had to have served itself. “The net effect was that evasi0n.com could survive a very large surge in traffic without having to build up its own expensive infrastructure,” he explains, touting the CloudFlare service. It’s interesting that CloudFlare had even been watching evasi0n – the company doesn’t typically notice all the sites that come under its watch, given that it now sees 3,000 sign-ups per day. But evasi0n was one of the few that jumped out at them due to the denial-of-service attacks it faced. The first actually began before the jailbreak’s release. On January 31st, afternoon PT, news of evasi0n’s forthcoming launch started making the rounds on Twitter, sending a large number of users to the site at once, effectively putting it under attack. The second, larger denial-of-service attack, came courtesy of actual attackers, not enthusiastic jailbreakers, and it took place in the middle of evasi0n’s peak traffic period. This type of attack is known as a SYN-flood, and it’s meant to overwhelm the network resources of unprotected websites. “This is becoming an increasing pattern that we see where, when a site starts to get popular, attackers will launch attacks to knock it offline when the sites’ servers are already struggling,” Prince explains. Cydia, however, didn’t fare quite as well under the onslaught of new users. On the day of the release, Freeman began sharing charts of the traffic spike, which saw 14,000 hits per second during the first afternoon of evasi0n’s release. Instead of sales, Freeman offered data from Google Analytics. The date range on the below charts is February 4 through 6, but the data reflects the 4th only. (The charts don’t update that often, he says). Here you can see the spike, and the 2.3 million uniques it sent during day one. But Freeman isn’t entirely sold on the Google Analytics data, saying that he’s not certain of the 2+ million uniques because of the way Google measures things, as well as its general slowness to update. He is, however, confident that there were over 4 million unique devices using Cydia as of 11 PM last night. That number, remember, includes devices not associated with the evasi0n jailbreak, though. And it also includes devices running the earlier popular jailbreak redsn0w, who are now “converting” to evasi0n. Freeman also explained that due to Cydia’s downtime during the launch, some devices may not have been counted. Earlier this morning, official evasi0n.com stats came out, saying that the site had seen 5 million uniques, and 40 million pageviews. One of the jailbreakers, @Pod2G, even later broke figures down by country after getting a lot of requests for region-specific data. China beat out the U.S. by a few hundred thousand visitors, the chart shows – this, despite reports that jailbreaking in China was on the downturn. Perhaps the Chinese, like the rest of the world, was just in need of a decent jailbreak. Another way to gain insight into how big of a deal this current jailbreak is, is to look at the repositories (repos) that host the jailbreak applications users find while browsing Cydia. Some of the most popular of these include BigBoss, ModMyi, ZodTTD, and MacCiti, for example. ZodTTD, which offers video game emulators, themes, and other apps ported to iOS, had seen steadily decreasing traffic due to a lack of a current, untethered jailbreak before evasi0n’s release. “On the day of the evasi0n jailbreak release, traffic increased over 1,000 percent,” the operator, who asked to just go by ZodTTD, tells us. “While I don’t have specific download counts sorted out just yet, terabytes of packages were downloaded from my repo on launch day. “This was a significant showing for a jailbreak release,” he adds. Kyle Matthews of ModMyi, the largest jailbreaking community on the Internet, meanwhile, just had a record-breaking day. Matthews says his repo saw triple the average number of visitors, and quintuple its average number of pageviews, following evasi0n’s release. “Yesterday, specifically, we hit a traffic record for us, over 685,000 visits. Our previous record was 645,000,” he says. ModMyi also set a record for online simultaneous users specifically on its website (that is, not the repo, just the forums and news sections) of 20,073. The previous record was 15,002. Below, you can see evasi0n’s impact in a tale of two charts. The first shows average traffic for a Sunday through Tuesday in January, pre-evasi0n. 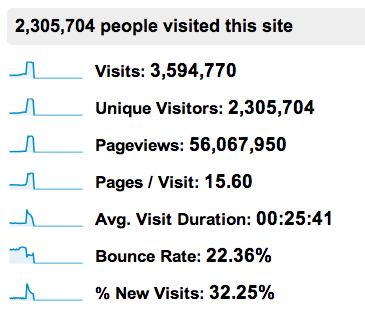 That one shows 475,000 visits, 338,000 uniques, and 1.5 million pageviews over those days. The second is after evasi0n, again Sunday through Tuesday (noon ET). Now it has climbed to 1.7 million visits, around 900,000 uniques, and 7 million pageviews. Michael Babiy runs the theme-heavy MacCiti repo, which currently hosts around 3,500 themes and other pieces of artwork from hundreds of artists. The second day after the jailbreak release (around 17 hours into day two), MacCiti saw 950,446 pageviews, which tops the last significant traffic increase the site saw back in May 2012, when Absinthe 2.0 debuted. That time, pageviews peaked at 680,000 per day. “I wouldn’t be surprised to see our daily visits double from the previous release,” says Babiy, of evasi0n’s impact. Numbers are still rolling in, of course, but the reports here are enough to put the argument to bed that no one cares about jailbreaking their iOS devices any more. There’s still a core crowd of users who obviously do care, and who will jailbreak the minute the software becomes available.